As a popular machinery construction material, seamless steel pipe has gained great attention because of its unique advantages. The production of the seamless steel pipes is orderly continuous process based on united working condition. It is an important feature that makes seamless steel pipes different from welded steel pipes. It can provide productions with higher quality more efficiently. And orderly yield working condition is very beneficial to controlling welding quality and guarantying physical dimension. Because of the neat cast and average-distributed welding lines of the seamless steel pipes and good orifice ovality and end perpendicularity of seamless steel pipes guarantee the precision of groups of seamless steel pipes in the process of welding on site. The trend of the development of the pipelines is large diameter and high strength. With the increase of the steel pipe diameter and the progress of steel grade, the trend of creating expansion ductile fracture enlarges. According to the relevant research institutions test, the seamless steel pipe and oil casing is at the same level, but the seamless steel pipes possess higher impact toughness. 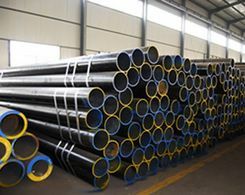 Cold rolled and hot rolled seamless steel pipe: the cold rolled seamless steel pipe is to make steel bars proceed with cold drawing, cold bending, under the cold drawn, acid pickling processing and then become various types of rolled steels at the room temperature(above recrystallization temperature). While cold rolled seamless steel pipe is a kind of manufacturing process which roll steel plates below recrystallization temperature. There are two kinds of making process of seamless steel pipe, hot rolling and cold rolling. The advantages of cold rolled seamless steel pipes are fast molding speed, high yield, and able to make into a variety of cross section forms to meet the needs of the all kinds of use conditions. Cold rolling can make the rolled steels produce large plastic deformation, so that it can improve the yield point of seamless steel pipes. Hot rolled manufacturing technique can destroy the casting organization of the steel ingot, refine the grains of seamless steel pipes, and eliminate the defects of the microscopic structure, so that it can make the organization of the rolled steel more close-grained, with improved mechanical performance. The advantages of welded steel pipe compared with seamless steel pipe are as follows. Make molding strip steels as base mental to guarantee good uniformity of wall thickness and high surface smoothness, reaching industrial net surface level 2b grade. The welded steel pipes after molding use high temperature which is higher than 1040 degrees to proceed with bright annealing to eliminate stress. Adopt melding to weld, and welding material composition is changeless. The welding lines have the same crystal structure as the base after high temperature heat treatment. And then carry out the destruction experiments such as flattening, reversed bending welds flaring, etc. In addition, the problems of crazing or cracking and burring in welding spots. 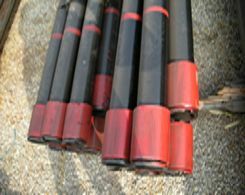 And it is necessary to proceed with eddy current testing and hydraulic pressure or gas test to ensure the quality of the pipes. How to Clean the Stain of Welded Steel Pipe?